Hank Bruder, who starred at both Pekin High and Northwestern University, went on to become the outstanding pro football player ever produced by Central Illinois as his brilliant ten-year career with the Green Bay Packers would attest. 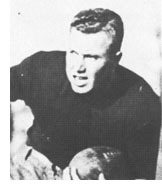 He captained the 1930 Northwestern squad that was undefeated before bowing to Notre Dame in the season finale. The Pack was 76-32-3 during the decade Bruder played, and he was one of the most valued of the Packers, both on offense and defense. He scored 16 touchdowns and four extra points in Green Bay, his 100 points putting him 32nd on the current all-time Packer scoring list. Bruder was named to the Packer Hall of Fame in 1972.